The Fantastic Four have a common origin; they all knew each other before Reed’s space flight and all where on the ship during its test. This all caused them to be exposed to the dangerous cosmic ray’s, that lead to each of them developing their fantastic powers. collectively they conclude that now that they possess these powers they must stand up for and do whats right, and agree to form The Fantastic Four. From Mole Man at their debut, to the Skrulls a couple of months later, the team was in for a rapid start. Serving at the time to be Marvels only hero’s and for a while only team. the ongoing dynamic quickly being established, the Fantastic Four acting like more than a team, being more like a family. From the playful conflicts of The Thing and The Human Torch, the courting of Sue Storm by Reed Richards. This first family continued to develop under the hand of Stan and Jack. In some times the greatest threats where those that also posed the potential of braking up this family, from Namor to Doctor Doom; both in their own way connected, and a potential wedge. 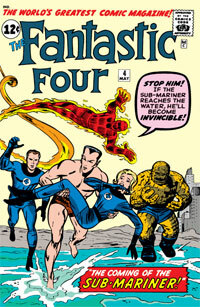 The Fantastic Four would not be limited to earth as well, traveling the distant stars as early as Fantastic Four #7, then not only fighting on the moon in Fantastic Four #13, but discovering the ‘blue area’ and meeting the watcher in the same issue. Then there is the supporting cast, Alicia Masters, the things main love interest debut in Fantastic Four #8 and has proven to be a regular from that issue on, loving the thing for what and who he is, even as a rock covered beast.